If ever you think that you are too late in life to start a new gardening project, look to George Russell and his Lupins. Russell, a Yorkshire gardener was in his fifties when he decided to breed lupins that had vigour and colour that was missing from the ones he knew. In his mind’s eye he say brightly coloured lupins dancing in his Yorkshire garden. Over the next twenty years, working alone on his allotments, he crossed seedlings, ruthlessly weeding out the inferior ones and re-crossing the best, until he had produced a range of lupins in dazzling colours. From palest pink to darkest crimson, white, yellow, orange and red, some a single colour, others bi-coloured Russell’s lupins embraced the whole spectrum. In 1937, at the age of 79, Russell exhibited his plants at the RHS Chelsea flower show, where the spires of colour he had dreamed of caused a sensation. In post-war Britain Russell Lupins brought a world of colour and gaiety to gardeners who had seen little of either for too long. Before Russell began his breeding programme the Lupin best known to gardeners was L. polyphyllus. A North American species brought to Britain in the 1820 by plant explorer David Douglas (his eponymous fir tree was collected at the same time). The plant grows to about 1.2m tall and has flowers that range from blue to pale violet, often with a dark stem. Although the genus consists of about 275 annual, perennial and shrubby species from North and South America, Europe and Africa, L. polyphyllus is one of the very few that has made the leap from the wild into gardens. The tree lupin, L arboreus, a Californian native, is a gangly shrub that is covered with spikes of clear yellow flowers during late June and July. Quick growing but short lived it thrives on poor, well drained soil. Graham Stuart Thomas wrote that the flowers’ perfumes is ‘deliciously fragrant’. I find it a sickly sweet smell; it is certainly strong. There is a form with white flowers and another with flowers that are a washed-out blue colour. While the species have not caught on with gardeners, Lupin hybrids have been popular since Gertrude Jekyll advocated their use as strong vertical accents amongst irises and lilies. Jekyll was fond of white-flowered lupins, one of the best of which is L. ‘Polar Princess’, a compact plant which, at 60cm tall, is shorter than most lupins. The flowers are a pure clean white. I grow it in front of a taller hybrid, L. ‘Masterpiece’ , one of the best named varieties that have been introduced recently. The flower stems are packed with dark-blue buds that open to purple flowers. As the flower matures an orange speck develops at the base of each petal. Propagating named varieties of lupins by cuttings is a slow process. Most plants that are available at nurseries and garden centres are seed-grown and several seed strains have been developed by plant breeders. The ‘Gallery’ series is a group of low-growing lupins, usually about 50cm tall, that have mainly yellow, orange or red flowers. They will flower during the first year after the seed is sown. The seed is often sold as a mixture but you can occasionally find single-colour seed. Lupinus ‘Gallery Red’ is worth growing for the intense colour of the flowers. The odly-named ‘Band of Nobles’ seed strain is much taller, with plants growing as high as 1.2m. Again, they are usually sold as mixed seed but a several of the series have been named. L. ‘The Governor’ is particularly striking, with flowers that have two white upper petals and three indigo-blue lower ones. The ‘Tuttl Frutti’ seed range contains a high proportion of plants that have bi-coloured flowers. The gorgeous and vibrant lupins that we have today, and which continue to be produced by modern plant breeders, can be traced back a hundred years to a glimmer in George Russell’s imagination. During that time their popularity has ebbed and flowed, as it will in the future, but there should always be a place for elegant plants like these in my garden. 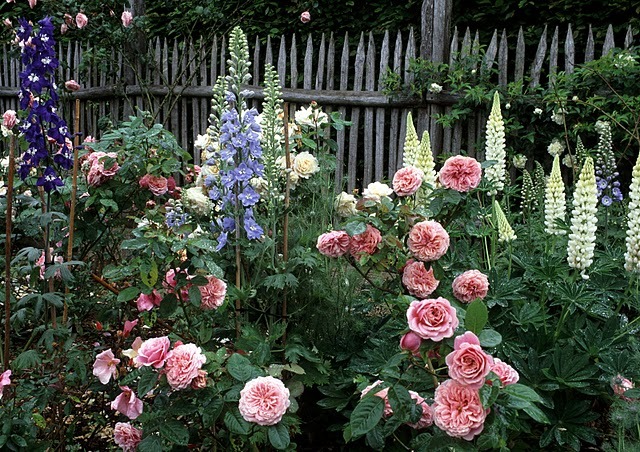 Lupins, Delphiniums and roses. A classic cottage garden combination. Le Jardin du Batiment, France. 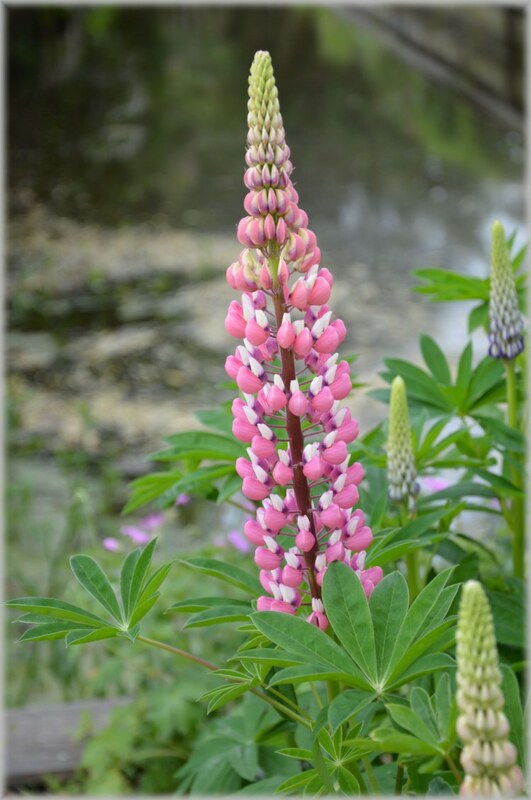 Lupins are best in an open, sunny situation in well-drained soil. In rich soil they produce lots of foliage and few few flowers so don’t manure the soil before you plant them. Conventional wisdom has it they they wont grow on chalky soils and while they are more vigorous acidic loam they grow perfectly well on chalk. Cut down the flower stems as soon as the flowers are over. Not only are they ugly but the masses of seed the plant produces eventually weakens it and so shortens the plant’s life. North American Lupin aphids arrived in Britain thirty years ago and are now widespread. These are about 4mm long, much larger than most aphids, and left unchecked will rapidly form large colonies that cause the plant to wilt. According to the Royal Horticultural Society native hoverflies and ladybirds are not drawn to Lupin aphids. As soon as you see them (they’ll probably be hiding on the undersides of the leaves) wipe them off or spray with soapy water. If you use chemicals, there are lots around that will deal with the pest. The aphids help the spread of viruses, and in particular, the cucumber mosaic virus. Despite its name the virus attacks a wide range of plants, including Lupins. The first sign is yellow mottling on the leaves, followed by distorted foliage and stunted growth. Dig the plant up and burn it to prevent the virus spreading. Since George Russell did his work breeding Lupins in vibrant colours, new generations of breeders and nurserymen have followed his lead. Russell’s original lupins were championed and popularised by nurseryman James Baker, whose fields of Lupins near Wolverhampton attracted hundreds of gardeners when the plants were in flower. Disease, poor breeding regimes and, finally, building development in the 1960s saw the loss of many varieties collected by Baker. Former National Collection holder, Pat Edwards, did much to recover and preserve some of Russell’s named varieties. Flagging interest in the genus was revived by nurserymen Brian and Maurice Woodfield. Working in the same was as Russell they spent several years to produce a range of magnificent lupins. Anyone who saw their first exhibit of lupins at the 1984 Chelsea Flower Show could not fail to be impressed by the colour and sturdiness of their plants.